I was provided with a product for my review. All opinions are my own. One of my favorite things to do during the holiday season is to curl up on the couch with a stack of my favorite Christmas magazines. On a chilly night or afternoon, this is such a cozy thing to do. My beautiful Warm Tradition Hot Water Bottle makes this even cozier, and I love using it all the time. Whether it's to ease my occasional back pain, or to keep my toes toasty in bed during the night, a good hot water bottle can be a great comfort. I've used a lot of hot water bottles through the years, and not all of them worked very well. Often times they leaked, or gave off a plastic odor, or lost heat after a short while. This isn't the case for Warm Tradition, and I'm very happy with mine. The hot water bottle covers come in so many different designs and fabrics, that it's hard to choose just one. I chose my cable-knit sweater style cover because I like it's classic, pretty look. Fun & fashionable way to melt away aches and pains & stay warm and toasty this season with 100’s of luxuriously soft & huggable covers to choose from. Long lasting heat – up to 6 hours! Warm Tradition is Martha-approved, and that certainly means they meet a high standard of quality. 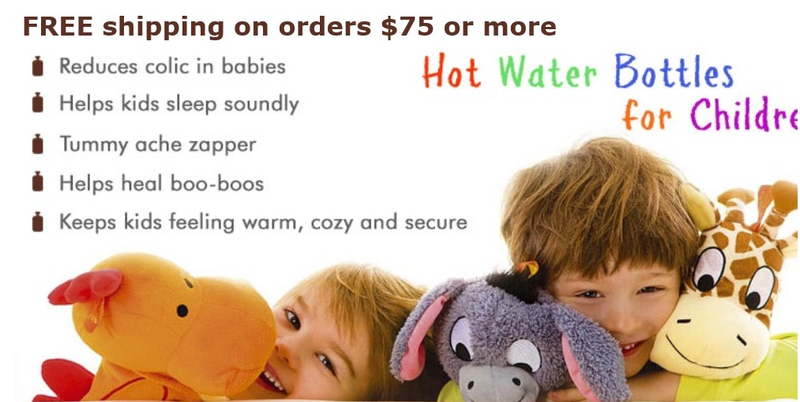 Kids love the warm comfort of a hot water bottle in bed at night, or on a tummy that needs to be soothed. You will find many cute cover to chose from for kids. Let them pick out their own, and add to how much they will enjoy using it. 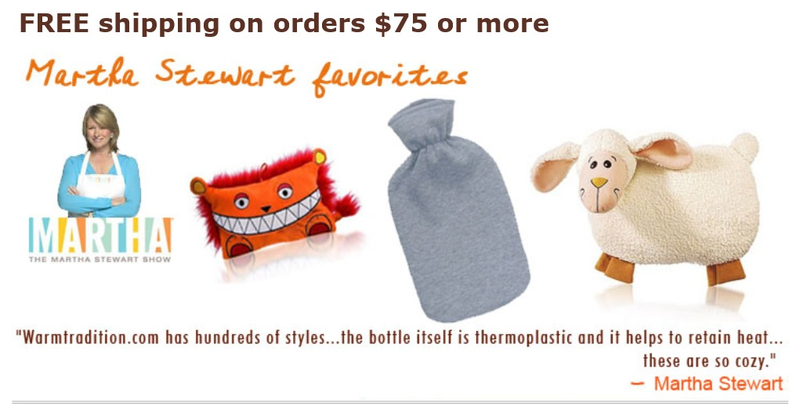 A hot water bottle for friends and family on your holiday shopping list makes a great gift. Choose a cover that fits their personality to make it even more special. Let Warm Tradition keep you and your family cozy during the cold days and nights of winter. I'll be using mine to do just that. 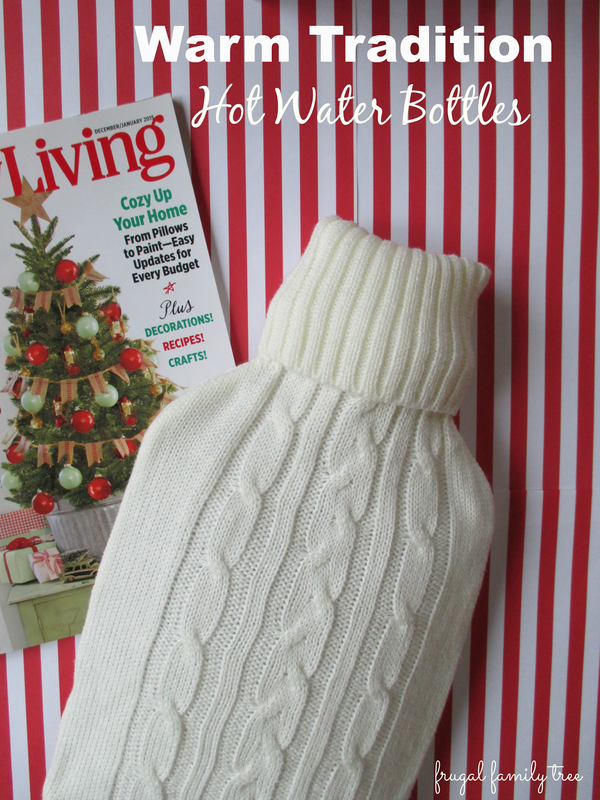 Here at Frugal Family Tree, we are pleased to be partnering with Warm Tradition to be giving away two hot water bottles, to two of our readers. *Limited to US residents 18 years old and above. Giveaway starts Dec 12, 2014 and ends on Dec. 24, 2014 at 12:01 am EST. Winner will be emailed and has 72 hours to respond before another winner is selected. I was not paid for this giveaway or post. The opinions on this item are 100% mine and may vary from others. The sponsor is responsible for providing the prize. I was sent a product to review for this post.